I love it!!!!!!!! Seriously! One of the very light and funny expressive photos I’ve ever seen! Greetings, Christine, and I’m happy the giraffe brought a smile to your face! I have one of these images framed in my home and it reminds me to live life playfully! I just perused http://egyptolution.com/ — what a great resource for individuals heading to the Land of the Pharaohs! I hope to return someday soon. Oh wow!!! I didn’t know you’ve also been here to Egypt! Next time please tell us of your coming!!! I’d be delighted to meet you for sure! Where have you been in Egypt and when?! Our trip there was back in January 2004 – we visited the Pyramids, Saqqara, the Egyptian Museum, and beyond. We also met up with my parents’ sponsored child in the outskirts of Cairo. I’m hoping to visit the Valley of the Kings someday soon! How did you get up so close to her, hope you did not scare her? PicCap, welcome! She was just on the other side of a fence at the Lion Park outside Johannesburg, towering over me. Indeed, she was as curious about me as I was about her. I stood underneath with my camera as she popped her head over the fence to say hi. :-) Such a playful creature! I love the expressions! So human! love this… thank you for stopping by and the follow. My pleasure, Sriram! 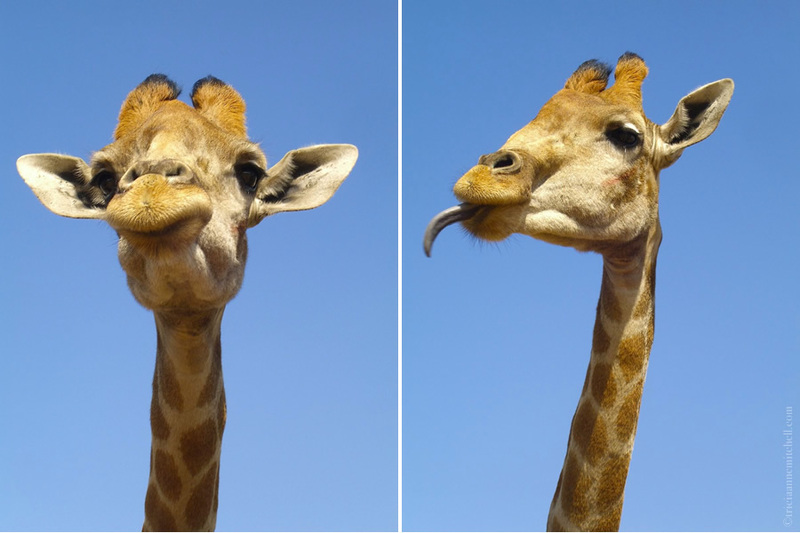 I captured this playful giraffe on film several years ago, but seeing the snap still makes me smile. Nice shots. Our trip to Kruger was the first time that I held the SLR. There were so many photo opportunities…and I missed the all. All pics are out of focus. I need to plan a trip to Masai Mara to make up for it! Thanks, Sonia. With such a playful personality, this giraffe was fun to mingle with. I never did make it to Kruger National Park, opting to visit the closer Pilanesberg. Did you get to spot the Big Five? I recall seeing three during my time in South Africa. Of all the giraffe, you focused on the face. Thanks for showing me something that I have missed about that incredible creature!. Hi Ron, with that brilliant blue sky, and the giraffe’s curious demeanor, I was drawn to the face, and not just the gentle’s giants towering form. :) Thank you for your comment, and happy travels! Ceece, glad you enjoyed the series! Indeed, I had a wonderful time in South Africa. Now that I’ve been able to explore Jo’burg and Pilanesberg National Park, I’m eager to make it to Cape Town too. Thank you for stopping by.